When the graduation speaker for the Class of 2016 stepped onto the podium at La Châtaigneraie last week, there may have been some raised eyebrows. The community usually expects to see someone from "the outside world", perhaps even someone famous, but here was a familiar figure from the corridors, classrooms and courts of La Chât. It turns out there was more to Pat McKinzie that most people realized. A lot more. Thank you students, families, staff, and administrators for this opportunity to address you on such a momentous occasion. Some of you know me as the coach, or Year 13 tutor, or maybe just as “that weird lady that wears sunglasses indoors”. Others probably wonder what I’m doing here, but as a good English teacher, I’m here to remind you; never judge a book by its cover. What you don’t know is that your sweatsuit-loving coach grew up in a short skirt shaking pom-poms as a cheerleader for the boys, because girls weren’t allowed to actually play sports. That in my 20s, after nearly dying in a car accident, I didn’t know if I’d ever hold a pen again, much less grade twenty English papers in one sitting. That I’ve worn dark glasses for a decade not to look cool, but as part of a treatment for a mystery illness I’ve been fighting most of my adult life. I’m not here to complain about my hardships, but to remind you that there’s more to people than meets the eye, and to share some of the lessons I’ve learned, in hope that they will serve you as you go on and write your own life’s story. That being said, when David Woods [Principal of La Chât] approached me about speaking at graduation, I had a million reasons I shouldn’t do it – I am afraid of public speaking, I am not rich nor famous. And I knew that graduation speeches are about giving advice. Advice. Ha! After teaching nearly half a century and raising two kids of my own, if there’s one thing I’ve learned, it is NEVER try to advise teenagers – they already know it all. When I was 18, no adult could tell me what to do. My high school teacher advised me not to drop out of French class, and I replied “Je m’en fiche si je ne peux pas rouler mes Rs. Je ne vais jamais avoir besoin de parler francais.” Et alors, wouldn’t you know it, I ended up playing basketball in Paris, then wound up marrying a Frenchman. And I still can’t roll my r’s. To be honest there is only one reason I am up here speaking today, and you are looking at that reason: the Class of 2016. I stand here with knees knocking, and hands shaking, because of you. If you have the courage to sashay across this stage in stilettos, I can hang on to the podium and hold myself upright. I have been humbled by your talents. I learned from you every day. In education, we assume teachers uplift students. Yet, a day never went by where I wasn’t inspired by you. As a teacher, I watched you excel as academics, artists, and athletes. In my role as a mentor, I also saw you fight depression, battle cancer, overcome learning difficulties, endure the loss of a loved one and adjust to moving to a new country for the fifth time. You surmounted heart-wrenching battles that exemplify character. You faced each day with courage, dignity, and grace. Thank you for giving me a reason to get up in the morning. My goal was to support you through the IB. What you didn’t realize is that you kept me going as I endured another medical treatment that entailed taking antibiotics in doses strong enough to kill a horse. Each morning tossing out tangerines to Class 13/5 gave me a lift; every evening watching ball players shoot jump shots brought me joy. We are at opposite ends: I am retiring looking back and you are looking forward, with aspirations of becoming leaders in your fields. When I was your age, my ambitions were a little different – all I wanted to do was play basketball. But I grew up a small town girl in Illinois, with three strikes against me – tall, smart, athletic – at a time in United States history where women were supposed to sit down, shut up and serve others. Medical authorities believed that if girls ran too fast they would collapse, or their ovaries might fall out their bodies. Think I am kidding? For her graduate research my university coach hooked electrodes to players during a game to prove women’s hearts would not explode by running the full court. Europeans already knew the health benefits of sports for women; they first played basketball in the European cup in the late 1930s. But it wasn’t until 1972, when I was 15 years old, that the law in the United States finally caught up. Title IX passed an amendment to the Civil Rights law, mandating equal opportunity in sport and education regardless of race or gender. Finally, doors were opened. I became the first female athletic scholarship recipient in Illinois, a premier draftee into the first women’s professional basketball league, and one of the first American women to play in Europe. But I faced intolerance, ridicule, and resistance every step of the way. As anyone who has faced discrimination knows attitudes take longer to change than laws. Today’s female athletes fly to games, have personal tutors, train in state of the art facilities. In the seventies, we drove cars eight hours to games, turned around, drove home and still made it up for an 8am class. In the pros, when we hadn’t been paid in months, we survived on peanut butter, hitch-hiked to practice and tore up eviction notices. In Europe, I lived in a flat the size of a shoebox, washed clothes in a bathtub and, in the pre-internet days, my only connection to home was via letters that took weeks to arrive. Did I ever want to quit? Absolutely. My number one tip: if you get knocked down, get back up. In secondary school, while society scorned me, I ignored the naysayers, and kept working on my jump shot. In college I battled broken bones, and in the pros I fought back from financial disaster. Then I struggled to fit in abroad. When the French banned foreigners in their women’s league, I started over in Germany, but first I had to learn German. At every step of my career, the stakes grew higher, the risks greater, I battled back from injuries to continue competing until a snowy day mid-season in 1983. I fell asleep in the back of a car en route to Paris. One minute I was dreaming of making a last second shot, the next instant I flew weightlessly through air as our car flipped off the autoroute. I woke up in a river fighting for my life. Afterwards, in the lonely days in the hospital, I wondered what was left. Forget playing ball: I wasn’t sure I’d ever walk again. It was two years before I could read a book. How do you deal with those life-changing setbacks? How do you keep your dreams alive after defeat? You show up even when you don’t feel like it. I transferred the discipline ingrained from being a pro athlete to putting one foot in front of the other, to staying fit, even if that meant only walking to the end of the corridor, and to enduring pain by pacing myself. I don’t know what challenges you will face – we don’t get to pick our opponents – but I know you have the strength to meet them. Like the IB, nobody said your path would be easy. Each step forward requires choices and sacrifices. My second suggestion: look out for the underdog – some day you will be that dog. My education was unique. I was the only white player on an all black team, the only English speaker in French ball club, and the only American on a German team. I learned that though we may differ in the foods we eat, languages we speak, and customs we practice, we are all alike in our need to be accepted for who we are. As you go forward, be aware of ways you may unknowingly discriminate against others. Imagine no longer being able to sing, dance, strum a guitar, ride a bike, play ball – to do what you love most – because of skin colour, religious belief, national allegiance, gender or sexual orientation. Then keep in mind how privileged you are to have the opportunity to follow your dream. In some parts of the world even pursuing an education can be life threatening. Just ask Malala. You are all exceptional individuals, blessed with an international education. Use it. Go out and make the world a better place. Thirdly, have a back-up plan – that’s why I always carry a notebook. Make plans and set goals, but as in ball games, be ready to draw up a new play, to redesign ways to go up, over, or around obstacles, whether imposed by society or yourself. Focus on what you can do, not on what you can’t. I thought when I retired from the pros, I’d ski Mont Blanc and run the Boston marathon; injury made that impossible. But I can walk, talk, write, speak, inspire. And I can coach. No matter where I lived or who I worked with, I made sure that everyone had the RIGHT to participate, so no one ever had to feel the shame of being left out. You didn’t get into the university you wanted? Embrace the school that did want you. Sometimes what you see as an obstacle is just life showing you a different path to take. I didn’t want to move to a foreign country to pursue my dream, but if I hadn’t, I wouldn’t have met my husband, wouldn’t have my children, and wouldn’t be here today. Fourthly – now this is huge! – it is not about you. Later in life you will realize it was never about you alone. It is about you as a team, part of an organization, a community, a family. Somebody helped you get here and somebody paved the way. We cannot know who we are if we do not know where we came from. We all stand on shoulders of the women and men who came before us, and they are not always famous. In my class some of you discovered that you are the grandchildren of war survivors & refugees. You don’t have to look far for strength and inspiration. When I was growing up women never had the opportunity to become highly educated nor to play in NCAA championships. Role models? Forget it. I didn’t know any female basketball players, doctors, lawyers. But fast-forward two decades and our daughter played in an NCAA Final Four and earned a medical degree. Our son, also a La Chât alumnus, became the fourth generation of our family to go into teaching and coaching. My children, raised as global minded, bilingual Franco-Americans, are a product of Ecolint. Their lives were shaped by a cohort of La Chât teachers retiring this year, who shared their love of language, literature, history and humanities, totalling up to over two centuries of experience and knowledge. So, graduates, in your celebration remember gratitude. You didn’t get here on your own. Who helped you? Parents, teachers, coaches, community members, friends? Tell them thanks. Better yet, write a note. No, not a text message. A real letter where you spell out the words. Finally, don’t be alarmed if takes years to figure out what you are supposed to be doing. I finally know what I want to be when I grow up…a coach. I spent the first half of my life fighting for the right to participate, and the second half learning to graciously cheer for others to run, jump, play. I never imagined coaching a future US President as my grandpa, a lifelong friend of Ronald Reagan, did, but here I am working with the sons and daughters of diplomats, CEOs and international leaders. In whatever career you pursue, I urge you to do as I have done: see the best in people and then coach the best out of them. Just as I always saw the best in you. I grew up feeling like a misfit, never belonging. I never realized that no matter where I went, I was home right here on the hard court. And all my trophies couldn’t help me get up and walk again. I did not want to rewrite my script when an accident left me crippled in pain and then later an illness robbed me of years of vitality. But in my odyssey from the cornfields of Illinois to the City of Light to the International School of Geneva, I learned that we can write our own destiny – even if we have to relearn how to hold a pen. 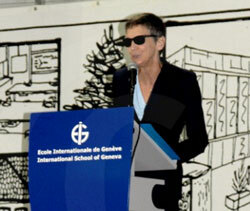 Now you know the mystery of the woman behind the dark glasses. I am not a superstar, just a feisty tomboy who fell in love with basketball at age five and refused to take no for an answer. You don’t have to be rich or famous or a celebrity to make an impact. It begins with one life. You never know how the right word at the right time can make a difference between hope or despair. You each have a gift. You all have a story. Share it. 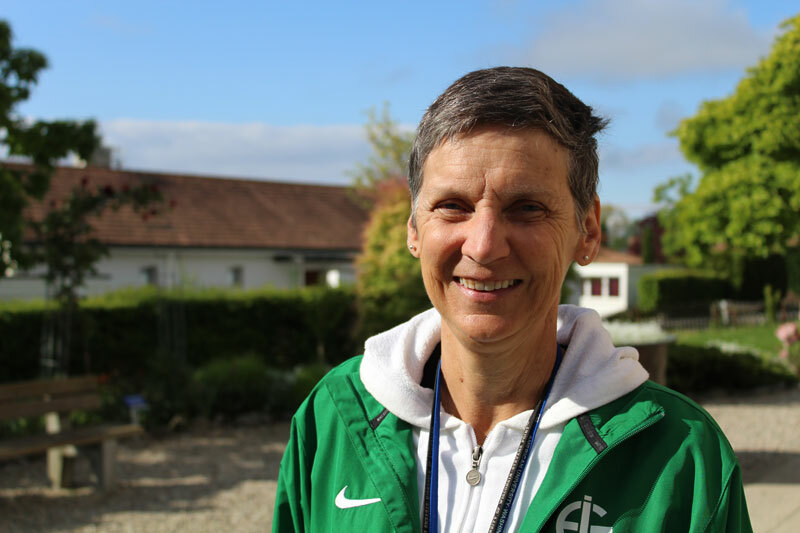 I lived and learned and loved in the Ecolint community. I bid you farewell with a heart filled with gratitude. It was a privilege to work with the dedicated teaching staff and talented student body. As I step back into the shadows, YOU go out and shine. Show up. Stand up. Speak up. Be the best YOU can be. Now I need all of you to give me a hand and help cheer, let’s raise the roof for the Class of 2016! Go on out and rock the world. 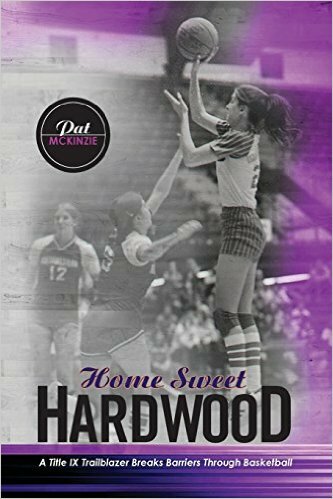 > Follow Pat's blog and buy her book "Home Sweet Hardwood" from her website.